Chief town of the county of Antrim, province of Ulster, Ireland. 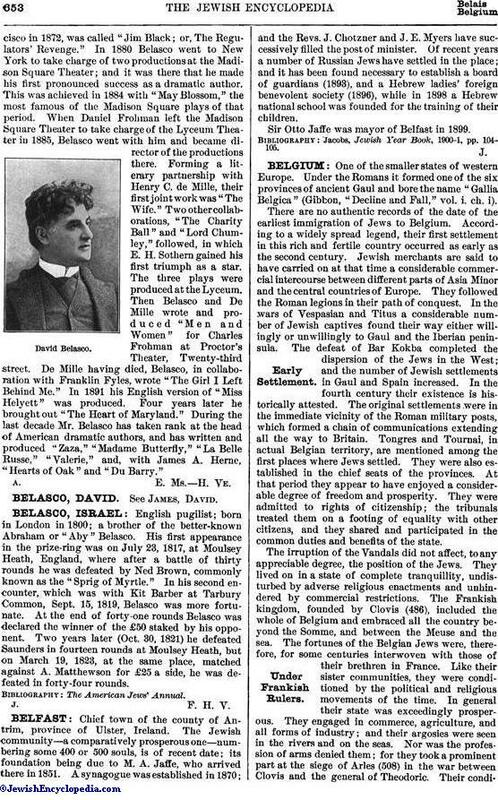 The Jewish community—a comparatively prosperous one—numbering some 400 or 500 souls, is of recent date; its foundation being due to M. A. Jaffe, who arrived there in 1851. A synagogue was established in 1870; and the Revs. J. Chotzner and J. E. Myers have successively filled the post of minister. Of recent years a number of Russian Jews have settled in the place; and it has been found necessary to establish a board of guardians (1893), and a Hebrew ladies' foreign benevolent society (1896), while in 1898 a Hebrew national school was founded for the training of their children. Sir Otto Jaffe was mayor of Belfast in 1899. Jacobs, Jewish Year Book, 1900-1, pp. 104-105.